MEDIUM BLUE Plastic Brake-Fast Bowl. $14.99. The Brake Fast bowl is designed to slow down a rapid eater. There are a lot of dogs out there that will wolf down their food so fast that it actually can cause stomach problems. The brake fast bowl has raised pieces in here that are designed to force the dog to have to pick his way around and he cannot push this bowl around and just inhale the food. It's designed to slow him down. I've had real good luck with these. They work great with that dog that just cannot help himself and wants to just eat as fast as possible. One thing to know about these, though, these plastic bowls are not indestructible and I do not recommend that you leave them with the dog. "Thank you for the solution to our feeding problem and the ensuing entertainment." I got 2 bowls for my dogs. Jasper is a 2 year old yellow lab, a complete chowhound. This is hysterical. He keeps diving at it and chases it all over the kitchen and/or kennel trying to gulp. He is slowing down as needed, but it is a comedy. Piper has slowed down, too, but she has figured out the delicate and effective bite taking method. Thank you for the solution to our feeding problem, and the ensuing entertainment. I wish I had video for you. "This bowl has done a great job of slowing down my dogs gulping of her food." This bowl has done a great job of slowing down my dogs gulping of her food. "Bowl was frustrating to her for the first few meals, but it did not take long to figure it out." Meals went from 30 seconds or less to about 3 minutes. That has to be better for digestion. Bowl was frustrating to her for the first few meals, but it did not take long to figure it out. "Otherwise, they're good quality for plastic, made in the USA, and really help to slow down your dog's feeding." Cousin's dog ate our last brake-fast bowl, so they are destroyable. Otherwise, they're good quality for plastic, made in the USA, and really help to slow down your dog's feeding. This is our second one. Works like a charm! The dish slows the puppy down a bit. It slides around the floor, so it would have been nice to have a rubber ring around the bottom. Holds 5 cups -- for dogs from Beagles to Labradors. 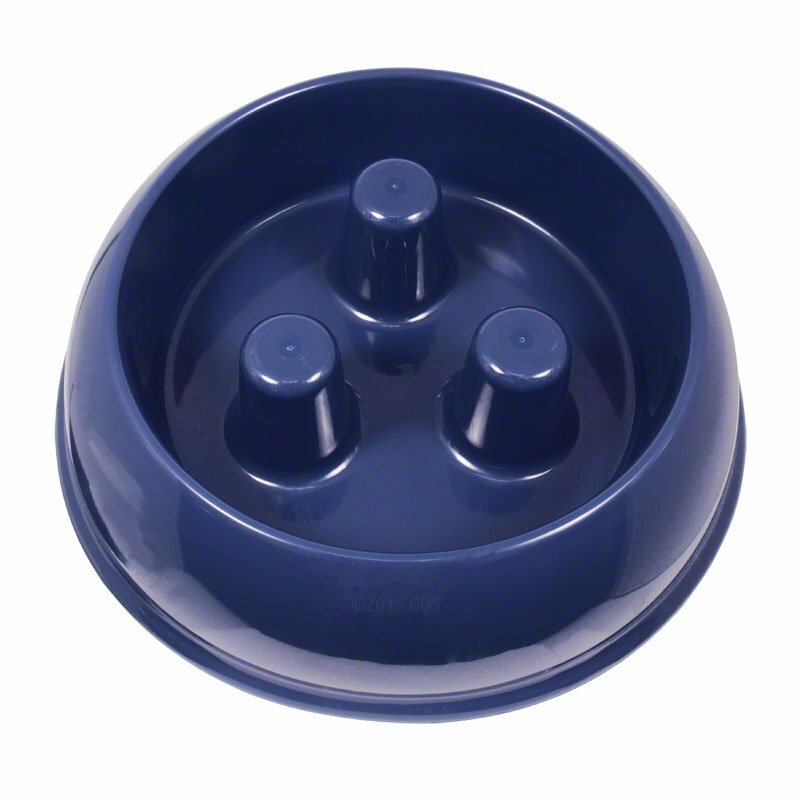 The Brake Fast dog food bowl has a patented design that prevents your dog from eating their food too quickly. The three center posts make dogs slow down to eat, and aggressive eaters will have to eat more slowly or else the Brake-Fast Bowl will be sliding away from them! Available in Large/Blue Plastic, Medium/Blue Plastic, and Small/Red Plastic. This bowl is plastic and is NOT chew proof. The large Brake-Fast bowl holds 8 cups and is best suited to large breed dogs like Mastiff, Great Dane, and St. Bernard. The medium 5 cup bowl works for dogs from Beagles to Labradors. The small size (1 1/2 cups) is best for small and toy breeds, puppies, and "flat-face" dogs. The small bowl can also be used with cats that eat too fast. Slower eating makes your dog feel more full and reduces "re-eating"